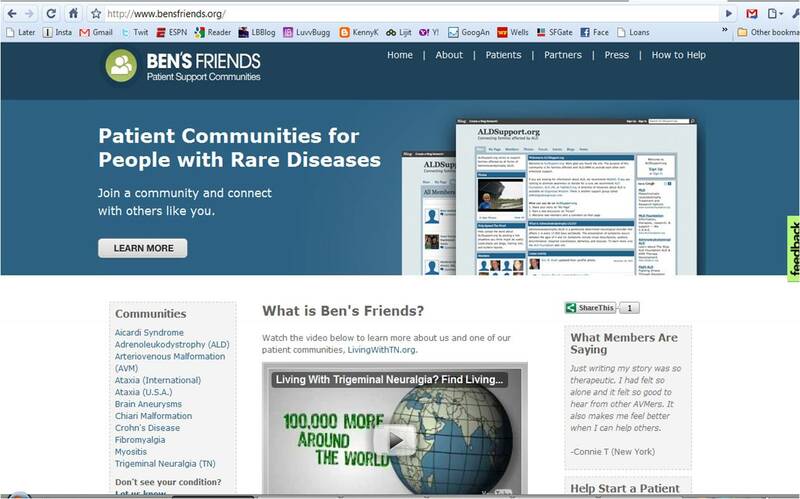 Ben's Friends, the patient to patient support networks that I co-founded continues to make a lot of progress. In April we did 151,000 page views for an average of about 5,000 per day. That's up from 143,000 (per day avg of 4,612) in March and 115,000 (4,107 per day) in February. Not too shabby! You can see below that we changed our homepage to a super sleek looking design. It's a work in progress and those site snapshot images you see at the top will be replaced by a picture of Ben and some of the folks on the network. We have the annual TAAF Annual AVM Awareness Walk this weekend in San Francisco. We sold over 150 shirts on the AVMSurivors.org network to raise money for the charity and about 50 people from the network are flying in. Sports Basement was a huge help in making the shirts! Our videos explaining Ben's story and why we started the networks have been watched 2,750 times on YouTube alone! We started a few more networks and are up to 11 networks now. We're planning on opening another 10 in June so if you have a need or a relative wants something started for them, please let us know and we'll do it. Greg, Haley & Michael all officially volunteered to help us recently, which brings the team to six and we couldn't be more thrilled! Everything is going really well and we'd like to tell more people our story. If you have a PR lead or know someone who knows someone, please make the connection. The networks make a huge impact in people's lives and our only frustration is that sometimes people have a hard time finding us.